If you’re staying in Blakeney and fancy a day trip or some evening entertainment, Westacre Theatre is well worth the visit. It’s the perfect choice if you’re fanatical about films and plays but prefer charming scenery to big city lights. Ivan Ball, 68, from North Elmham, has been attending Westacre Theatre for as long as he can remember, and is now a part of their team. 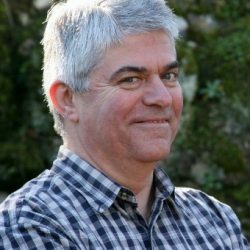 Ivan helps Westacre with publicity, including social media, local news and external website promotion. He also organises the art exhibitions in the theatre’s Foyer Gallery, which is of interest to keen visitors. 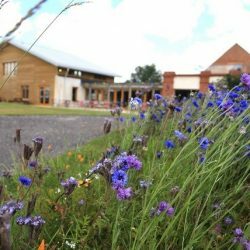 The theatre started life as a converted village chapel and now offers plenty of opportunities for visitors to be inspired. Ivan says there’s nothing else quite like Westacre. Ivan says that the theatre appeals to locals and holiday-makers alike due to its wide range of events and activities. One thing that pulls visitors together is that they all share an appreciation for theatre and the arts. Westacre is more than just a stage, despite the fully equipped studio auditorium being central to its all-inclusive approach. “You find most theatres in towns and cities, where there are lots of people. But Westacre Theatre’s scenic setting is in the rolling Norfolk countryside and comes complete with a lake. “In the summer, our sheltered South-facing terrace hums with audiences eager with anticipation. A short wander takes you to the walk along the tranquil River Nar. 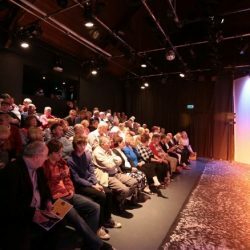 There’s a dynamic range of events on offer at Westacre Theatre, which are regularly added to their website. “Our own in-house theatre company regularly performs to great acclaim. The variety extends to plays of immense integrity and magical musicals, to well-known favourites or more challenging dramas. We also have a selection of touring companies who put on one-night shows. If that’s not enough, there are plenty of other events throughout the year that will appeal to visitors to the local area. Westacre offer sought-after art classes, craft master-classes and workshops. There are also weekly drama workshops for six to eighteen-year-olds throughout the year. The art exhibition displays inspiring art throughout the foyer, new bar and gallery area. You can enjoy the work at performance times, or by arranging beforehand. A charitable foundation oversees the theatre, so all proceeds go to the worthwhile cause of keeping the theatre alive for the next generation. The volunteers, cast and crew at Westacre play a key role in the activities that are offered. “We are supported by those who volunteer their time for a few hours each month and undertake tasks appropriate to their skills and knowledge. Westacre offers a range of delicious food and drink. If you’re having lunch or supper, you should book a table in advance. You can easily do this when you book your seats for your chosen performance. “The Café-Bar is open at performance times to serve a range of hot and cold drinks. Light lunches are served before the afternoon Wednesday Flicks, while simple suppers are available before most evening shows, whether on stage or screen. 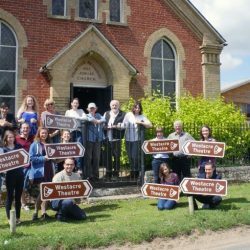 Visitors can find Westacre Theatre a short distance from the A1065 Fakenham to Swaffham road, marked by brown tourist signs. For satnav users, the postcode is PE32 1UD, but a location map can be found on the website. There’s plenty of off-road parking available for guests. For those with limited mobility, there are designated spaces by the front door. There’s also a level entrance and floor throughout the foyer and auditorium, and an accessible toilet. You can easily book a performance online, which Ivan recommends as the easiest option. Some performances sell out in advance, while others have limited availability on the day, which you can check out on the website at a glance. If you’re interested in booking a performance with Westacre Theatre, you can book online here. Alternatively, you can contact the team on 01760 755800 or email admin@westacretheatre.com.